Anderson Ford Motorsport is the premier supplier of 1994 and 1995 Mustang GT Cobra parts in Illinois. We have a huge inventory of products necessary to give your Stang’s performance a great boost. We know you want more muscle for your muscle car, which is why we sell the parts and accessories you need online. We have been in the Mustang racing and tuning scene for more than 20 years. We stock a range of quality components and even manufacture our own specialty parts to meet the individual needs and preferences of Mustang enthusiasts. We know the 1994 and 1995 Ford Mustang GTs by heart. The Anderson Ford Dealership sold these cars when they were new, and Anderson Ford Motorsport has been helping customers increase their car’s performance since. After 20 years of working on these vehicles, we know what they need to perform. No matter what 94-95 Mustang GT parts you need, Anderson has it, from our own top end kits to get your 'Stang's motor ready for forced induction, to stronger clutches to handle added power and even subframe connectors to cut down frame flex when taking corners. The 1994 Mustang was the pony car's first major redesign in 15 years. It's based on the SN95 platform, which has its roots in the previous generation's Fox body, but made major improvements to the car's suspension, using longer control arms up front and a revised four link setup at the rear. The redesign also replaced the rear drum brakes with discs. The 5.0L was carried over from the Fox body, but this time around, it was only available in the GT, and, for 1995 only, the GTS, a stripped down model akin to the old 5.0L LX. In stock form, it produces 215 hp, 15 hp more than it had in previous years. The first car built by Ford's Special Vehicle Team is the '93 Mustang SVT Cobra. This car uses a 5.0L with cast iron GT-40 heads and a different intake manifold. That same engine was reused with only minor changes for the new SN95-based Cobras, rated conservatively at 240 hp. Bigger brakes, unique wheels, and a retuned suspension rounded out the package. A convertible pace car was built for the 1994 Indianapolis 500, followed by a production version both with and without the Indy livery. The Windsor-based small block was replaced by a new overhead cam 4.6L motor in 1996. While "Mod" motors are a solid performance platform today, the new engine was an unknown quantity upon its release, driving resale values of 5.0-equipped cars above the sticker price of new cars still on the lot. On paper, the two motors delivered the same amount of power from the factory, but with decades of aftermarket development behind it, it was a lot easier to get power out of the 5.0. 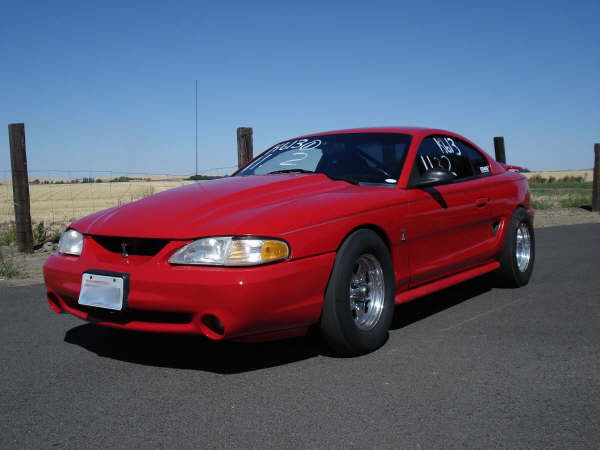 Today, choosing between an OHV engine or a newer OHC motor is more up to personal choice; starting a project with a '94 or '95 Mustang lets you get the improvements of the SN95 platform while keeping the old school small block. That means easier teardowns, a wide range of inexpensive performance parts, and the option of using bigger Windsor V8s with little in the way of modification. In fact, Ford did just that, fitting a 351 into the engine bay for the ultra-rare Cobra R, a production car in the loosest sense of the word that was sold only to licensed racers. Your search for premium quality Mustang GT parts ends here. Click any of the product categories above to view your options. You may also check out the featured items to learn what’s in store for you. If you can’t find what you’re looking for, please let us know. We’d be happy to assist you or source the parts for you. Follow the links provided on the left side of this page to learn more about the other products we offer. Contact us if you have questions about any of our products.